The Funkstronauts are ready to launch again for their 2nd Satellite Ranch Music and Arts Festival, September 1st and 2nd (Saturday and Sunday of Labor Day Weekend), at the beautiful Mountain Sky in Northeastern PA. We hope you join us for what is sure to be an explosive improvement over last year’s installation. Sign on for a memorable weekend of well-mannered frivolity to end the Summer in style with bright stars orbiting our region and beyond. 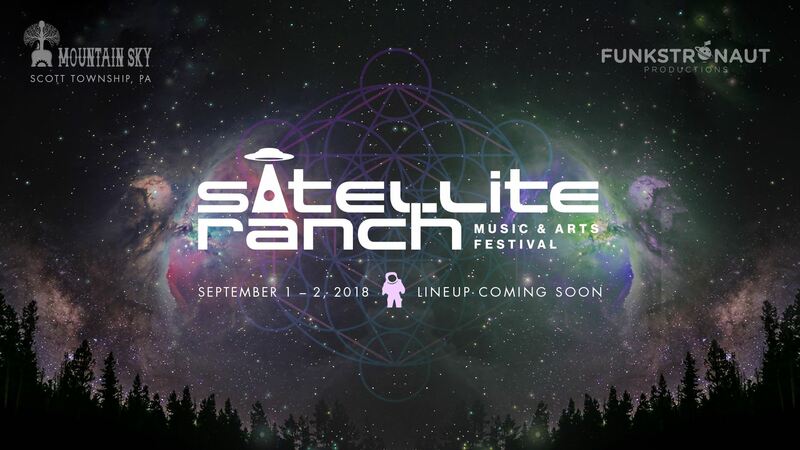 Like and follow Satellite Ranch Music & Arts Festival and Funkstronaut Productions to stay informed on details and updates as they arrive. -TIER 1 – $65.00 + fees. •ALL tickets include camping access, and there is plenty car-side camping. •There is ample parking ONSITE! •There will be a fee of $5 upon entry for each vehicle. •RVs and trailers will be charged $25 upon entry. •ALL vehicles subject to search upon entry! •LAST AND MOST IMPORTANT RULE – BE KIND! BE COOL! RESPECT YOUR NEIGHBORS! Failure to comply with the aforementioned rules can result in confiscation of forbidden objects and ejection from the festival with NO REFUND.